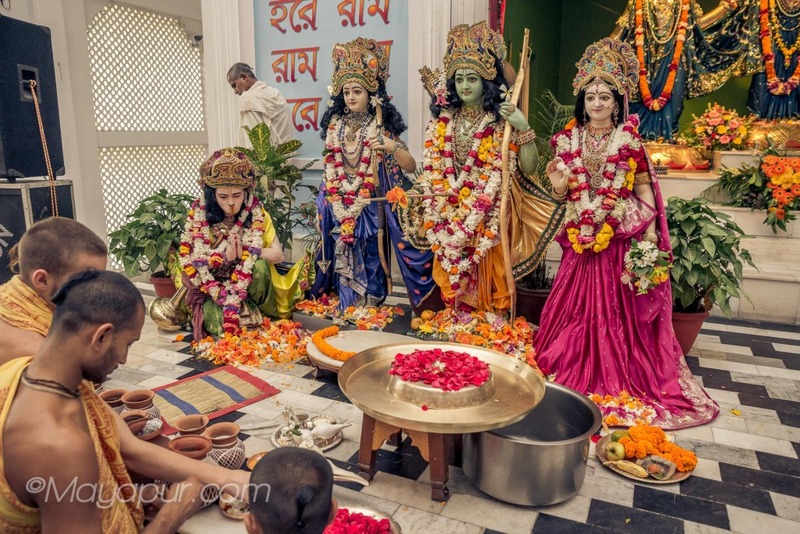 O n 28th March, ISKCON Mayapur celebrated Rama Navami (the appearance day of Lord Rama) with great zeal. The celebration had a very sweet flavor. 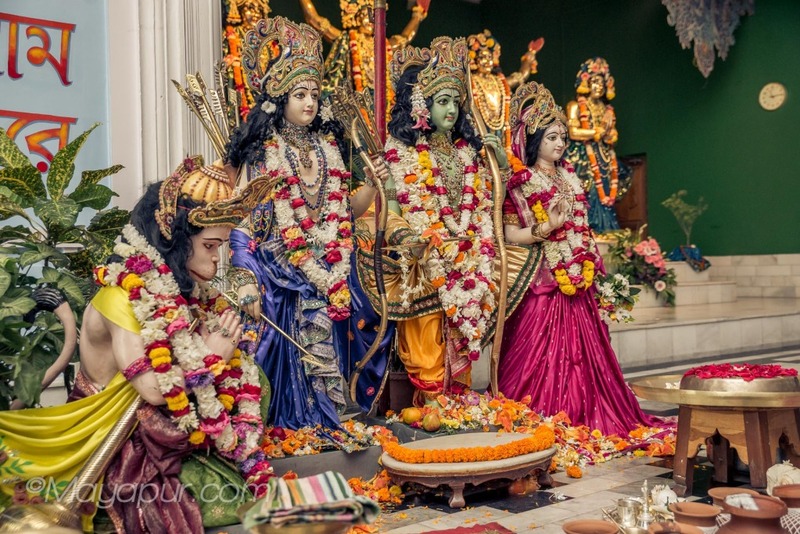 The deities of Sri Sri Sita Ram Laksman Hanuman were set in front of the altar of Sri Pancha-Tattva and They were beautifully decorated with different ornaments, jewels and fragrant flowers. 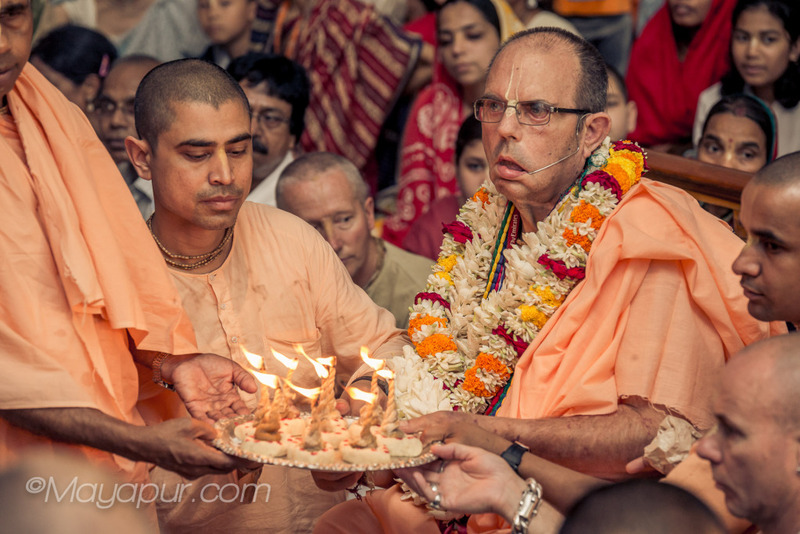 The devotees jubilantly danced and chanted “Raghupati Raghava Raja Ram…”. 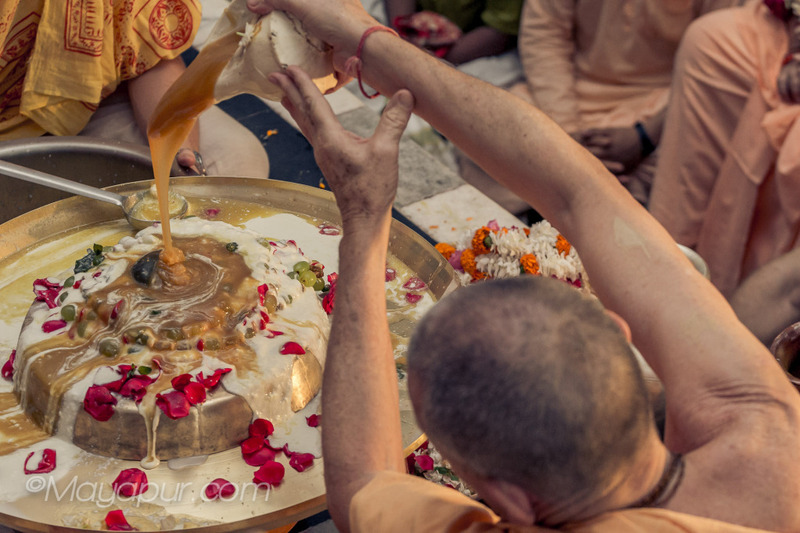 Around 11 am, devotees headed by Pankajanghri prabhu lovingly performed the bathing ceremony of Shaligram Sila of Lord accompanied by sweet kirtan. After the abhishek, Lord Rama was offered varieties of delicious and attractive looking food items prepared by many devotees. 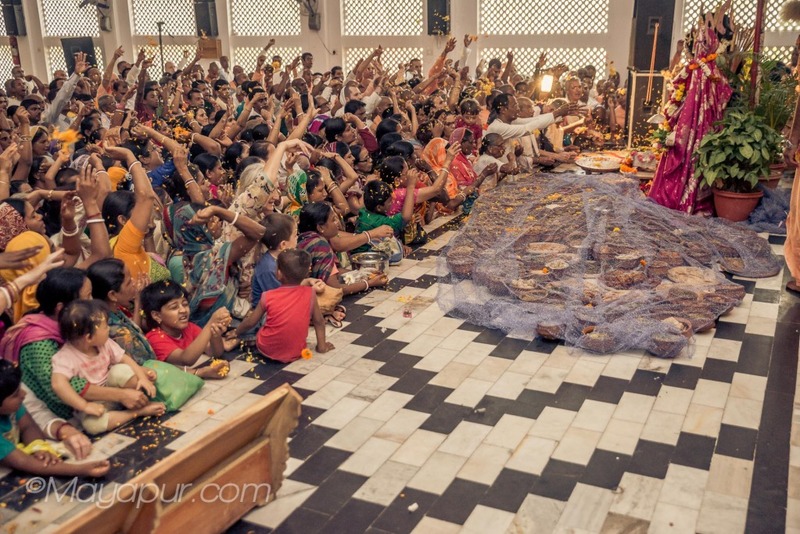 Next, He was showered with a rain of flower petals thrown by lotus hands of vaisnavas who surrounded Him. Lord Ramachandra, also referred to as Lord Rama, is the incarnation of Krishna who appeared in Ayodhya, Northern India during Treta Yuga (more than two million years ago). Lord Krishna says in the Bhagavad-gita Chapter 4 : “whenever there is a decline in religion, I personally come to restore the tradition of the Vedas and to protect My devotees”. Prior to Lord Rama’s advent, there was a very powerful demon named Ravana who was wreaking havoc throughout the world and disrupting the sacrifices of the saintly people on earth. 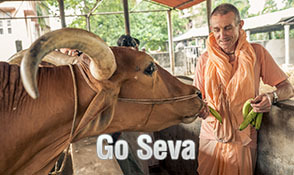 The sadhus of the world prayed to Lord to personally come and save them. He answered their prayers. There was a great king Dashratha who ruled over Adyodhya at that time. His life was perfect except for the fact that he had no son to whom he could pass down his kingdom. At the advice of his priest Vashishta, he performed a yajna (Vedic sacrifice) for Lord Vishnu, and in due time his wives gave birth to four beautiful sons named Rama, Bharata, Lakshmana, and Shatrughna. Lord Rama performed many glorious pastimes during His time on earth, but His most celebrated pastime was His slaying of the demon Ravana, who had abducted His wife Sita. Stories related to Lord Rama’s life are beautifully told in the original Ramayana by Maharishi Valmiki. Other historical accounts of Lord Rama’s life can be found in almost all of the Puranas (ancient Vedic stories), including the Mahabharata and the Shrimad Bhagavatam (Bhagavata Purana). Around five hundred years, Goswami Tulsidas wrote his own poem detailing the pastimes of Lord Rama, called the Ramacharitamanasa, also known as the Tulsi Ramayana. In this beautiful work, Tulsidas references all the stories of Lord Rama contained in various Vedic literatures especially the Valmiki Ramayana and the Brahmananda Purana. He merges them to tell the story of Ramayana in a mood of devotion and love. 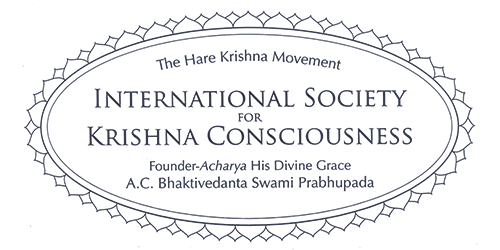 For this reason, it is considered to be one of the most important Vedic literatures. Lord Rama is considered an avatar of Vasudeva (Lord Krishna), and thus there is no difference between Him and God. He is usually worshipped along with His wife Sita, younger brother Lakshmana, and His greatest devotee Hanuman, collectively known as the Ram Darbar. Lord Rama played the role of a perfect human being, a role model for everyone. He was an ideal son, husband, friend, and king. He had no other interest in His mind other than to please His devotees and to serve them. To know more about Lord Rama as an ideal human, please hear lecture on Srimad Bhagwatam 9.10.2 by HG Sauri Prabhu. The lecture was given on Rama Navami day (28th Mar) and can be downloaded by right clicking the link : Rama Navami 2015 lecture.